Associate Professor William A. Smith and his wife Paula Smith, an associate professor in the Department of Educational Leadership & Policy, will receive the Black Student Union’s Annual Legacy Award on Jan. 12 in recognition of their continuous and outstanding service to the African American students at the U and in the community. For William A. Smith, the civil rights movement isn’t just history. It’s an event that ties together his family, his education, his scholarship, his passion. Smith grew up in Chicago, which in the 1960s was a focal point of the fledgling civil rights movement. His father, William “Smitty” Smith Jr., served on the traveling security team for the Rev. Dr. Martin Luther King Jr. and later as chief of security for the Rev. Jesse Jackson. As a boy, Smith didn’t know a lot about his father’s work. His parents had divorced and his father was often on the road. When his father was in town, he didn’t talk much about what he was doing, seeing and experiencing, Smith said. Smith’s father was in Chicago on April 5, 1968, when King was assassinated at the Lorraine Motel in Memphis. “Dr. King had sent him to the University of Chicago to pick up some papers,” Smith said. Smith’s father began working with Jackson, becoming his chief of security. In the mid-1960s, Jackson oversaw Operation Breadbasket, co-sponsored by the Southern Christian Leadership Conference (SCLC), which King had helped found. Operation Breadbasket worked on job creation and fair treatment of black employees and consumers. In the mid-1960s, King, president of the conference, named Jackson as the SCLC’s director of special projects and economic development. The new role required Jackson to travel around the country to organize black support for economic programs. Smith said his father once told a story about how he had accompanied Jackson to a town in southern Illinois where he was going to give a speech on civil rights. A white mob surrounded the motel and began shooting at the room assigned to Jackson, whom his father and others quickly escorted to safety in an interior room. His father also worked for Jackson during the creation of the Black Expo in Chicago, a trade and business fair, and Operation PUSH (People United to Save [later Serve] Humanity), both launched in 1971. Jackson merged Operation PUSH with his National Rainbow Coalition in 1996. The Black Expo was huge in enhancing black pride and an understanding of the accomplishments of African Americans, Smith said, given the discrimination and treatment the community had — and still — experienced. Operation PUSH’s mission was increasing economic opportunities for blacks. Smith’s father later served as a narcotics officer for the Memphis Housing Authority, as a Memphis police officer and as a Shelby County deputy sheriff. He passed away in 2007. Smith said his father and others who served the civil rights leaders willingly took on an “enormous” burden to make positive changes in society. They lost a lot in terms of personal relationships, economic opportunities, stability. Smith learned more about his father’s involvement in the movement from other activists — people like St. Clair Booker and eventually Jackson himself — as he began participating in civil rights activities with his mother and, later, on his own. In fact, though she wasn’t on the front lines like his father, Smith credits his mother Gwendolyn with molding and guiding him to a career that allows him to be at the forefront of today’s black intellectual and human rights movement through education. Smith’s mother was a teacher and also served as an interim principal at George Washington Carver Jr. High School in Chicago. But “my mother is the one who made me aware of black struggle, black history, black pride and so she is the one who shaped what I was doing and who I would become,” said Smith, who attended the University of Illinois at Urbana-Champaign. 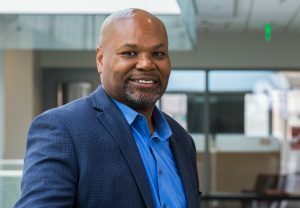 His research focuses on racial battle fatigue experienced by people of color and student diversity on university and college campuses, among other topics. “I was fortunate being in Chicago and speaking to Stokely Carmichael — later known as Kwame Ture — and other leaders,” Smith said. “All those people inspired me that they were out trying to do some good. That is why I try to do as much as I can, being highly active in community-based organizations. “I am about the strength of the black family and trying to do as much for young kids as possible. All those messages you hear from Jesse Jackson, recordings of Dr. King, Dr. John Henrik Clarke, Gwendolyn Brooks, Maya Angelou and the Dr. Phillip J. Bowman’s of the world about having pride in your background, trying to be a better human being and offering service to your community wasn’t lost on me. “They all inspired me and made me want to do better,” Smith said.